Arthur Barry Still was born December 5, 1955 in Camden. He was one of 10 children raised by his mom, Gwendolyn, who struggled mightily to make ends meet. Basketball was the family game—three brothers (James, Wendell and Dennis) went on to play college ball and his sister, Valerie, became the all-time scoring leader for the University of Kentucky. Although Art’s family teetered on the edge of poverty, education and achievement were nothing new to the Still clan. His great grandfather, James Still, was on of the first African Americans to graduate from Harvard Medical School. James’s brother, William, was a key figure in the Underground Railroad—much of what we know of its workings comes from the detailed memoir he published in the 1870s. William’s wife, Caroline Still, was one of the first African American female doctors in the country. Art’s game was football and he played the game with great passion and intelligence. At Camden High School, Art was the star of the Golden Panthers varsity in the early 1970s along with quarterback Derrick Ramsey. Ramsey was recruited by the University of Kentucky. One year later, Art followed his teammate to Lexington. Kentucky had a good team during the mid-1970s and Art was a big part of their success. In 1976, Frank Curci’s Wildcats took the Southeast Conference crown, and in 1977 the team finished the year ranked #4 in the nation. Art was named an All-American that year in his senior season. Art was taken by the Kansas City Chiefs with the second overall pick in the 1978 NFL Draft, right after Earl Campbell. During Art’s first two years in the league, he established himself as a formidable pass rusher. The Chiefs— a powerhouse in the early 1970s—were rebuilding their team. 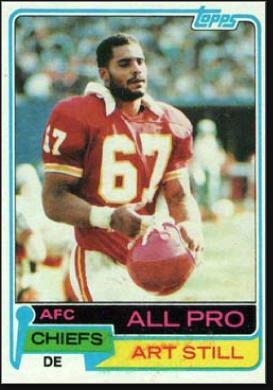 In 1980, he had 14.5 sacks and was a First-Team All-Pro, as well as the Chiefs’ MVP. He was also invited to the Pro Bowl for the first of four times in his career. In 1983, Art decided to become a vegetarian. He dropped 30 pounds and had a poor year. In 1984 he bulked back up and registered 14.5 sacks again to win team MVP for the second time. Finally, in 1986, the Chiefs made it back to the playoffs. Art was the veteran leader of a young defense that starred Deron Cherry, Lloyd Burruss and Bill Maas. Art’s young cousin, Devon, was also a football star. He was born in Camden but grew up in Delaware, and played college ball for Penn State, where he earned All-America honors. He was chosen by the Cincinnati Bengals in the first round of the 2012 NFL Draft.